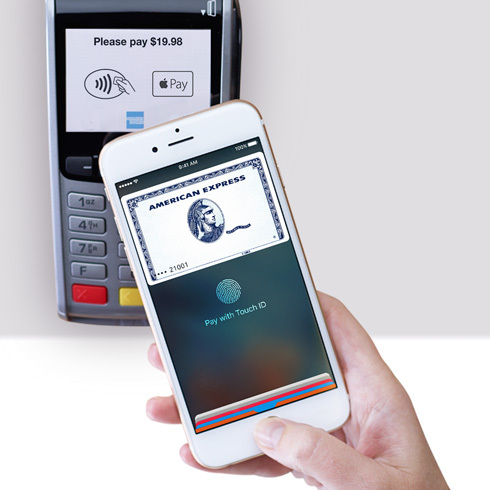 Apple Pay has launched in the U.S., U.K., Canada, and Australia to date, and the mobile payments service could expand to a fifth country this week: China. 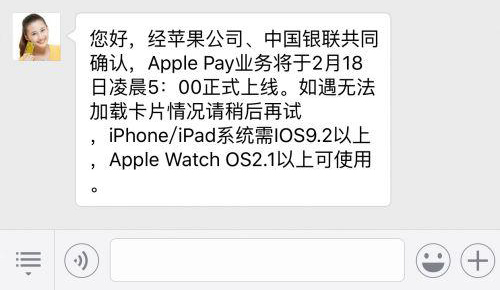 A customer service representative for China's Guangfa Bank, using the bank's public WeChat account, appears to have confirmed that Apple Pay will officially go live in the world's most populous country on February 18 at 5:00 a.m. local time. Apple previously announced that Apple Pay will expand to China in early 2016 in partnership with UnionPay, a state-run interbank network that holds a monopoly on the country's credit and debit card processing. UnionPay cardholders will be able to use Apple Pay on iPhone, Apple Watch, and iPad -- the latter for in-app purchases only. iOS 9.2 or watchOS 2.1 or later will be required, according to the screenshot. In November, The Wall Street Journal reported that Apple reached deals with China's big four state-run banks, including the Bank of China, China Construction Bank, Industrial and Commercial Bank of China, and Agricultural Bank of China, to launch its iPhone-based payments service in the country. The report said Apple Pay could launch by the weeklong Chinese New Year, which concluded on February 13. That prospective date has since passed, but a pair of YouTube videos surfaced in January that appeared to show Apple Pay working with UnionPay bank cards in China for both in-store and in-app purchases. It is possible that Apple soft launched Apple Pay in China with select participating issuers in order to test the payments service, ahead of its official launch in the country in a few days. Meanwhile, French website iGeneration claims that Apple is preparing to launch Apple Pay in France and could make an announcement in the first half of 2016 -- perhaps at WWDC in June. The report claims it is unclear when Apple Pay will become available in French stores, nor does it have information about which banks and participating issuers will support the service upon launch. Last, new evidence has been uncovered that hints at Apple Pay support coming to Canada's big banks. 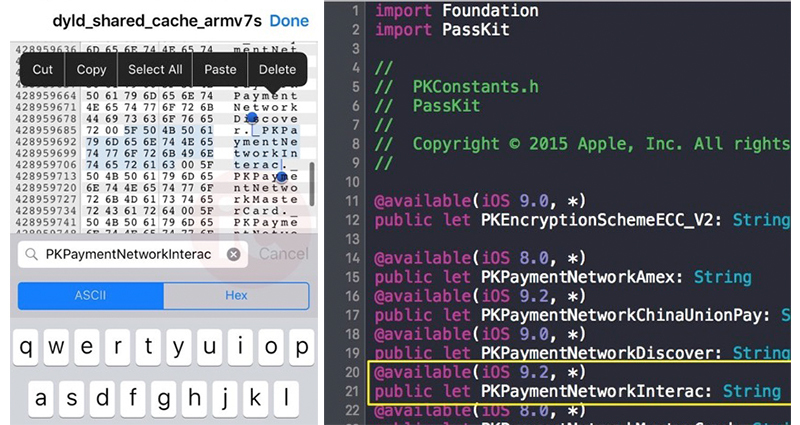 Specifically, Twitter user ChaseFromm2016 recently discovered a "NetworkInterac" string hidden in iOS 9.2.1 code, as shared by the blog iPhone in Canada. The same string was also shared on Chinese website Feng last month, in the screenshot pictured right, according to the report. Interac is Canada's official debit card network, adopted by the country's largest banks and credit unions nationwide, including BMO, CIBC, Desjardins, Meridian, National Bank of Canada, RBC, Scotiabank, TD Canada Trust, and many others. TD Canada Trust already stirred speculation in October when it inadvertently listed Apple Pay as a method of payment on its website, before quickly removing it. Apple Pay is currently limited to American Express cardholders in Canada and Australia, and the same partnership will be extended to Hong Kong, Singapore, and Spain later this year. Apple Pay is now available at more than 2 million retail locations, and Au Bon Pain, Crate & Barrel, Chick-fil-A, Cinnabon, Chili's, KFC, and Starbucks stores now do or soon will accept the payments service in the U.S.
Update: Reuters confirms that Apple Pay officially launches in China on February 18. Just for the sake of arguing: Canada has two official languages, English and Français. I have seen Pay signs in French at my local McDonald's, 'sti! If Interac is what will be used for Canadian Apple Pay, I think we will be fine as it is accepted pretty much everywhere from what I've seen. I don't own an iPhone, but I'm pretty excited for this anyway! And Apple Pay in France would be nice as well. Visa and MasterCard only go through the banks in Canada, so you're not really waiting for Visa, you're waiting for whatever bank you got it through. The only major credit card you can buy directly in Canada is American Express, and thats why if you have an Amex card from Amex (NOT through a bank), you can use it with Apple Pay in Canada. I hope the rumor about Canada is true ! Most canadians don't use amex in Canada... There is no apple pay in Canada until MasterCard and Visa decide to change things. Been using Amex here since Apple Pay launched in Canada and have had no issues. Most of the big retailers have contactless and Amex (Canadian Tire, Rona, Shoppers Drug Mart, Staples etc.). Great thing about Amex is there is no limit. Still laugh when the store assistants gawp when they see me use my Apple Watch. Expansion to the big banks is only a matter of time. I use debit wherever I can. And I've been using VISA Debit a lot too, where places don't take regular debit. If a place takes VISA, it most likely will also accept VISA debit. I've switched all of my online recurring payments (like iTunes) to VISA debit too. So much better than having a balance to deal with on the credit card. I don't have a rewards credit card. My opinion, but I think paying off a credit card balance once a month is well worth it for benefits and cash back from credit cards. To each their own though. Apple pays is not going well. Not in HomeDepot, Lowes, Walmart, Kroger, Target, Publix, QuickTrip, RaceTrac, ... Apple should have purchased LoopPay instead of spending hundreds of billions of dollars to buy and burn stocks. It was only $250 millions. Currently, Canadian banks pay 0.6 cents per debit transaction, as Interac is a non-profit that only charges its members what its operating costs are to handle the transaction flow. In the US, Apple wants 0.5 cents per debit transaction, just because they provided the user a device. If Apple Pay comes, it'll be interesting to see if Canadian banks were willing to almost double their debit card costs just to get access to some iPhone users, or if Apple has had to greatly decrease its demands.